These beads are called many different names including "eye," "skunk," and "crow medicine" beads. They are often seen in old necklaces and other items. A great black bead with white "eyes." Bead sizes vary but average about 10-12mm. Sold per bead or in 20-inch strands of about 60 beads. While not as commonly seen as the black eye beads, these were also used on early Native American items. The color can vary between a light cranberry and a brighter red color. 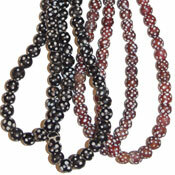 Bead sizes vary but average about 10-12mm. Sold per bead. Antique melon trade beads in dark and light green stripes. Beads are approximately 13 x 6 mm. Holes are approximately 3 mm. Sold by the 20-inch strand (approx. 40 beads). Padres were probably some of the most common trade beads that were available in North America. They are basically the same as what are now called "crow beads" and can really add a great touch to "old-time" craft projects. These are somewhat irregular and just have a great aged look. Well, they should… they're the real thing! Sold in strands of about 85-100 beads. Beads are about 6-8mm. Note that there are a number of padre variations. These are the beads currently coming out of Africa. Some of the real old padres are more round. Great old-time white beads. Slightly off-white in color. Sold in strands of about 100 beads. Beads are about 6-8mm. Red padre beads are much less common than the blue and white. Sold in strands of about 100 beads. Beads are about 6-8mm. Turqoise blue padres are the most common color. These likely date to the late 1800's. Sold in strands of about 100 beads. Beads are about 6-8mm. Turquoise blue padre beads that are in an earlier style than what is commonly available. These are more round and irregularly shaped. Stands are approximately 21 inches of about 90 beads. Some strands may include a few turquioise prossers of a similar vintage. Great old white hearts in the much sought after deep red color. These beads average about 8mm in diameter. 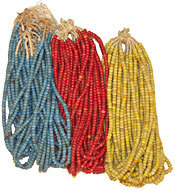 Strands are about 20 inches long and contain approximately 90 beads. A great size that is about the size of a crow bead.